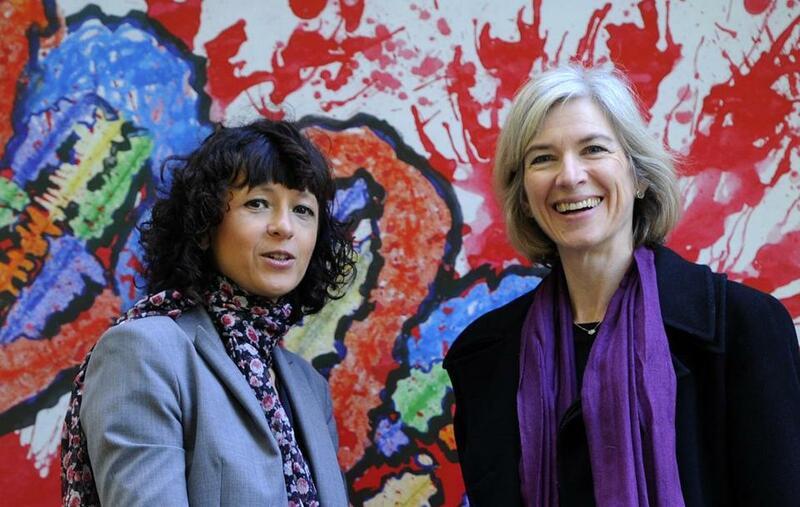 French researcher in microbiology, genetics, and biochemistry Emmanuelle Charpentier, left, and US professor of chemistry and of molecular and cell biology Jennifer Doudna pose in Spain in 2015. Before long, this taxpayer support was exploited by academic-industry partnerships, leading to highly competitive legal battles over key pieces of technology. In the late 1960s, Robert N. Yoshimori, working in the lab of Herbert Boyer at the University of California San Francisco, isolated an enzyme called EcoRI. Others — Ron Davis and Janet Mertz, working out of the lab of Paul Berg at Stanford — soon showed how the enzyme worked like a pair of molecular scissors, cleaving DNA at a unique sequence. This precise sort of cut allowed scientists to paste together viruses, circular DNA called plasmids, or even segments of human genes, by splicing the ends of code together. Boyer, with Stanley Cohen of Stanford, filed the first major biotech patent, the so-called Boyer-Cohen patent, which was eventually granted in 1980. This research started the biotech industry and companies such as Biogen and Genentech, which quickly appropriated these technologies to “scale up” proteins such as human insulin in a manufacturing facility. Along with associated patents, it would lead to income of $300 million for their institutions and themselves. Whether Boyer and Cohen had the right to obtain those patents remains a matter of dispute. Berg and Mertz recently commented on how the first major biotech patent was itself curious, since its application is conditioned on prior knowledge in the public domain, for instance, how to grow viruses and plasmids, and the workings of proteins, such as EcoRI and ligases. Now consider CRISPR-Cas9. Its patents are the subject of a proceeding based on legal questions of whether patents issued to Harvard and the Broad Institute interfered on a patent application filed six months earlier by Jennifer Doudna at UC Berkeley and Charpentier, who is now at the Max Planck Institute. Charpentier’s 2011 paper in the journal Nature revealed a key component of the CRISPR-Cas9 system that enabled its subsequent development as a technology. In what is now a legendary interaction on the cobblestone streets of San Juan, Charpentier and Doudna struck up a plan to describe the workings of the CRISPR-Cas9 system, which they published the next year in Science, with key intellectual contributions from Martin Jinek and Krzysztof Chylinski. In perhaps a testament to the applicability of the new technology, by January 2013, five major papers described application of the technology in eukaryotic cells (including human cells) that could be used to establish “reduction to practice,” a patent law term meaning it’s now an invention. “Five papers appeared in the space of less than four weeks. It was a virtual five-way tie, for all purposes except those related to patents, where differences of even a single day have to matter. The crucial point is that if any one group had failed or had taken longer, it would have made no functional difference to the rest of the world,” Erik Sontheimer, a scientist at UMass Medical School and cofounder of the CRISPR-Cas9 company Intellia Therapeutics, told me. Charpentier’s story is compelling in that she was working on basic research when she stumbled on a key molecule that interacted with the CRISPR molecule and enabled the system to work. Her story is refreshing, a lucky find in the galaxy of nature. Those finds are what make scientists tick. It’s also becoming clear that the federal funding engines have pressed biotech far beyond the imagination of Vannevar Bush to the point where there is an excess of competent science, where so many scientists are ticking so well, with the backing of industry partnerships, deep cash flows, powerful marketing arms, and lawyers. For instance, the Broad Institute draws deeply on public funding but has an executive pay structure. One reason for its pay structure is that it is designed to best optimize public funds to compete. And it recently added David Liu, a founder of CRISPR-Cas9 company Editas, as a core member, strengthening the alliance between the Broad Institute and its industrial partner. This signals that the tax base has been exploited to a degree that it is being used for leverage by the industrial partners who compete against each other. Drugs are expensive to bring into trial (the FDA has identified CRISPR-Cas9 as a drug, not a device), and patents are important; the question emerges, then, whether the industry that was jump-started in post-war era has become mature to the point where the academics can rely more on their industrial partners, less on the tax base. The question is not whether patents and capital should be kept out of science, but whether science is capitalistic enough. If who wins the CRISPR-Cas9 patent interference battle truly makes “no functional difference” to the rest of us, then why are we paying for those risks and financing? The STEM fields are the venerable stock of our modern times, which is why all those industrial buildings keep going up outside MIT. And, when you’re standing on the south bank of the Charles, you begin to think that they look strong, so strong, almost, that they might begin standing on their own.